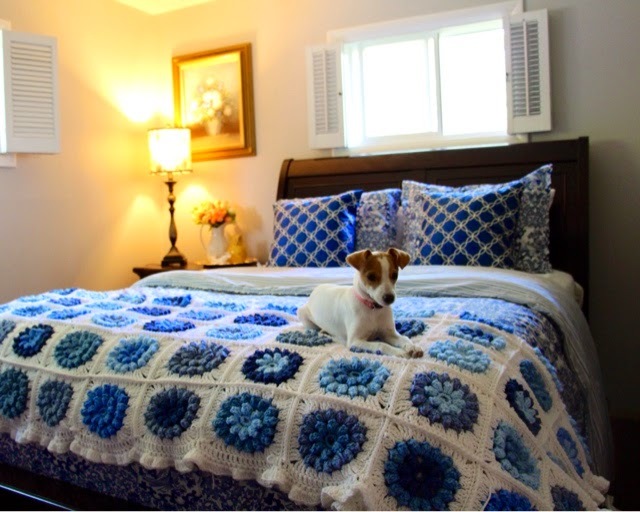 She has a really pretty all blue and white comforter ..I think it looks pretty good ! you can find the free pattern here. 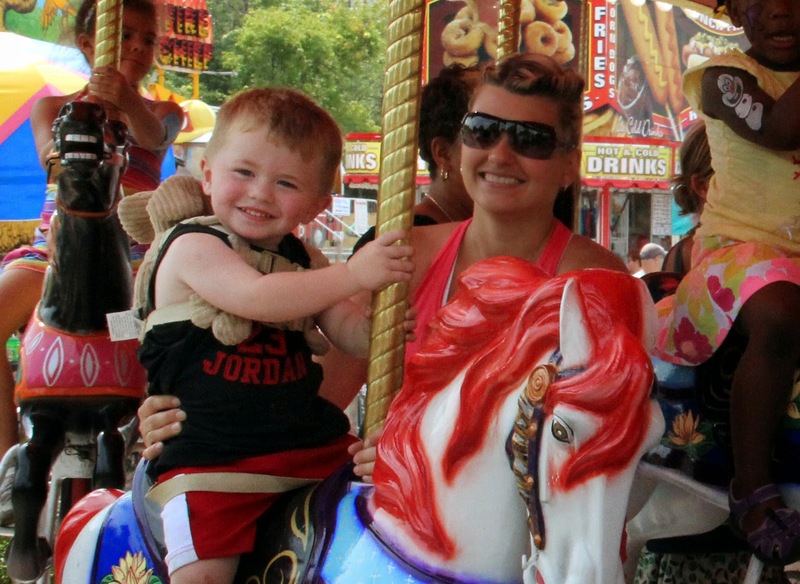 Last week we went to the Wisconsin State Fair..My daughter, daughter in law , and the three grandsons.. It was great ! Can't wait til next year to go again ! Its been a year since my daughter bought her cute house .. I keep telling her she needs to start a blog :) She loves to garden and do lots of diy projects ! Thanks so much for stopping by and your always sweet comments ! I love that pattern for the afghan. I need to make one! It goes perfectly on Chelsea's bed. A year already? Oh my gosh! Yes, she needs to start a blog! I just love that photo of her standing out in front of her house!!!! Beautiful! I love the color combo and blue is my favorite color. Your daughter's house is darling! Gorgeous! I love to crochet but would never have the patience for that! Your daughter's house is totally darling! 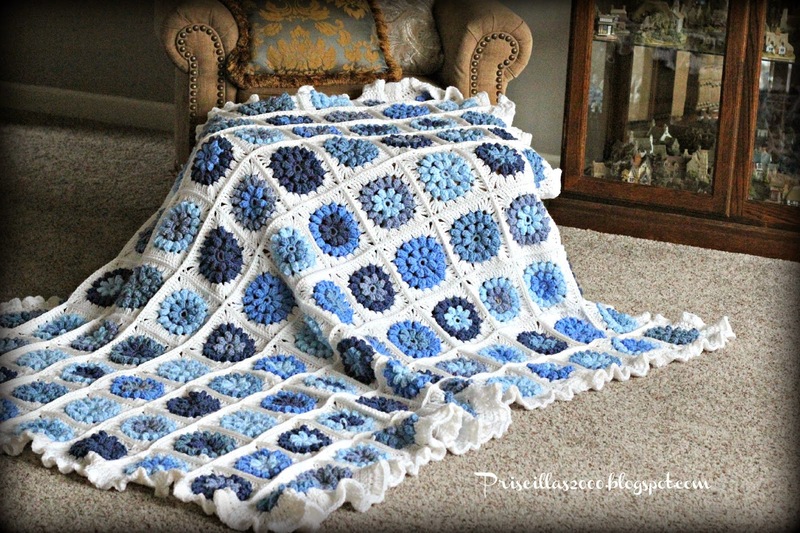 What a lovely blanket, Priscilla--you know me, I do love my blue and white :) It looks so perfect in your daughter's room. And her house is so cute--glad she's having fun with it. My son is looking at buying his first place, too--at 32 it's about time! 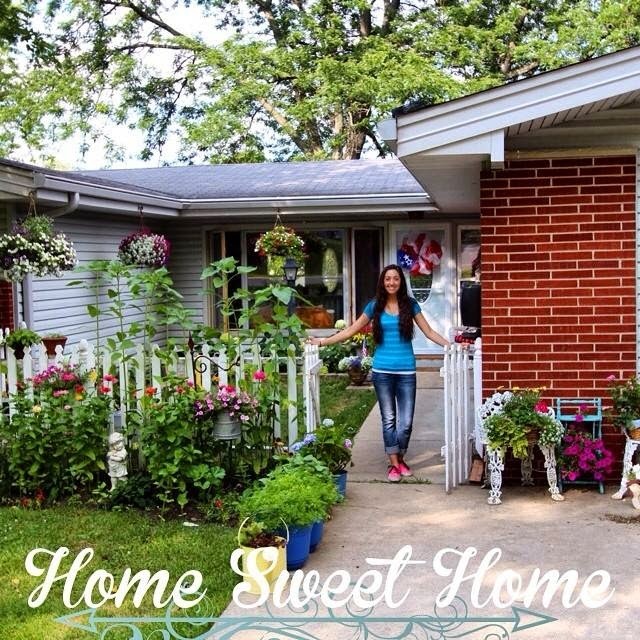 And your daughters house is cute too, I love seeing the pictures you share of your projects with her! Mother-daughter crafting/bonding time is the best! what a great garden your daughter has, and i love the blues in that blanket and your bedroom. 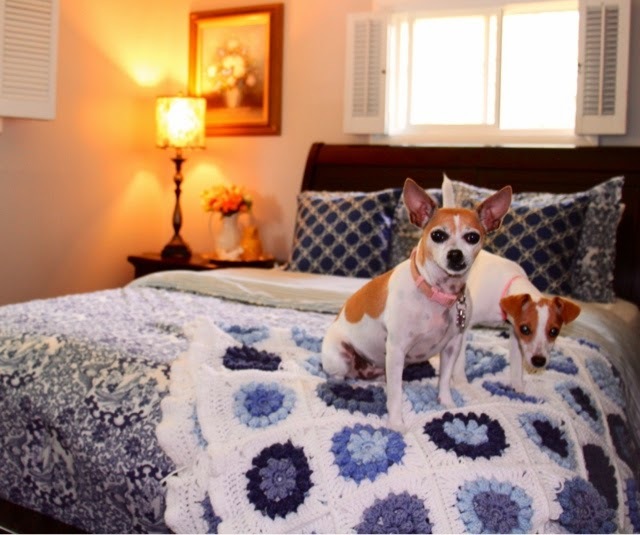 The fact that you finished that coverlet impressed me. I know how long it can take. It's so pretty and matches the room so well. Oh what a beautiful afghan! I love the way the blue flowers just pop! I'd love to have you link up at my first ever Yarn Fanatic Party! Beautiful Priscilla! It looks so nice on her bed. Your daughter's house is darling. I can see that she inherited some of her mothers talent! Yes, she should start a blog. Thanks for sharing with SYC. 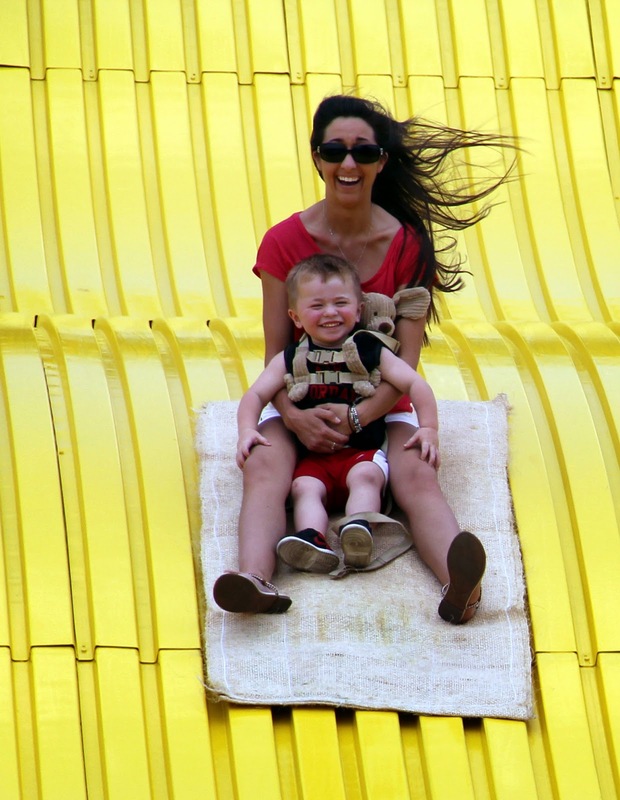 Glad you had fun at the fair! Beautiful afghan...I am getting more and more into blues. Your dau. 's house is adorable. 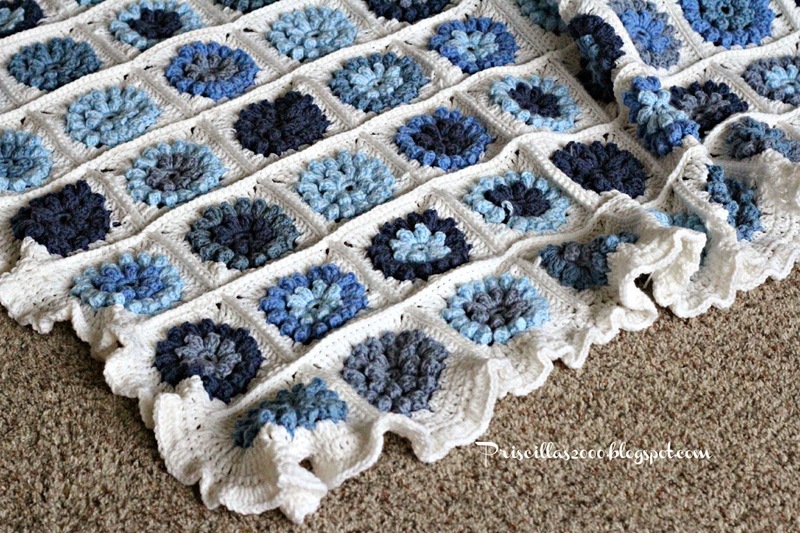 Wow, lovely crocheted blanket, I know it takes a lot of time. Funny how our pets always appreciate and love our work. Beautiful work. I love the pretty blues in your blanket and your daughter has such a charming home! 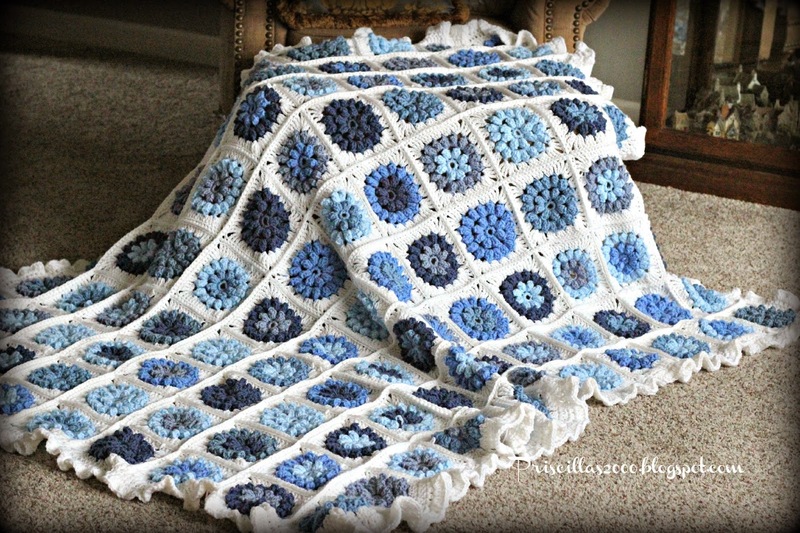 LOve the blanket, its a nice pattern but not sure I could do that large of a project. It is beautiful though. I like how you treated the windows too. That is a great concept. Those small windows are difficult to decorate with. Beautiful! Your daughters house is soooo cute! And what a photogenic pup! Choosing all those shades of blues was very clever. The blanket is gorgeous!